New offshore wind turbines with a total capacity of 818 megawatts went online in 2016. The industry views this expansion as positive and expects that, combined with optimised turbine technology and operating concepts, this will also lead to cost reduction in the forthcoming tendering processes in Germany. This momentum will however be upset by the reduced expansion targets after 2020 that are part of the 2017 Renewable Energy Sources Act (EEG). These reduced expansion targets will also lead to a number of missed opportunities for the industry. 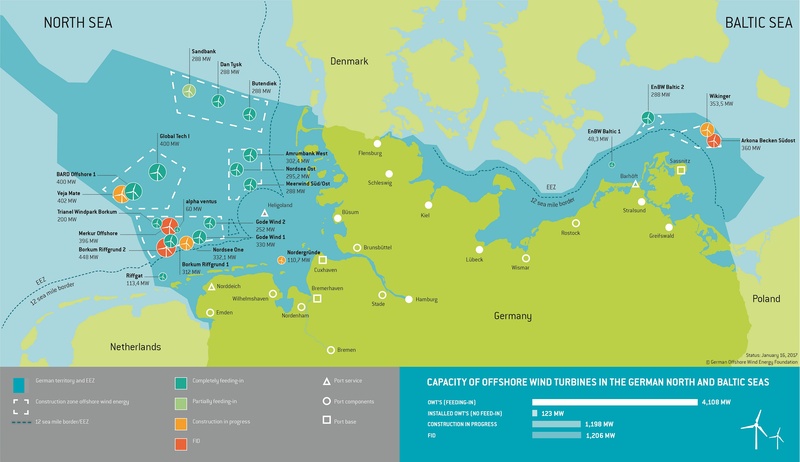 Berlin, 19 January 2017 – Last year, 156 new offshore wind turbines with an overall capacity of 818 megawatts fed their power into the German grid for the first time. This brought the total number of turbines on grid by the end of 2016 to 947, with a total capacity of 4,108 megawatts. In all positive figures according to the Working Group for Offshore Wind Energy (AGOW), the German Wind Energy Association (BWE), the Offshore Wind Energy Foundation, VDMA Power Systems and the WAB Wind Energy Agency. The amount of power generated by offshore wind turbines was around 13 terawatt-hours in 2016. This represents an increase of almost 57 per cent compared to the 8.3 terawatt-hours generated in 2015. This consolidates offshore wind power’s position in the German power mix, supplying around 3 million households with electricity. This roughly corresponds to the combined number of households in Berlin and the state of Brandenburg. Another 21 turbines with a total capacity of 123 megawatts were fully erected in the previous year, and are currently being connected to the grid. Offshore expansion will continue with about 1,400 megawatts in 2017 followed by a steady average of around 1,000 megawatts a year until 2019. The latest tendering results in Denmark and the Netherlands have shown that the greater the project volumes the more significant the cost reductions. This is also to be expected here in Germany, even if the conditions in the aforementioned countries are not exactly the same as in Germany: wind farm lifetimes and output volumes vary, and this has an appropriate effect on the calculation of the project costs. Unlike in Germany, operators in Denmark and the Netherlands do not have to bear the costs for the transformer platforms. The projects there are also significantly nearer the coast, leading to additional cost reductions.